When she's not immersed in data, CCO's Claudia Zanchetta can be found diving into the depths of the ocean – sometimes as far down as 35 metres. CCO's Claudia Zanchetta on a dive. A friend once dared her to try scuba on a trip to Turks and Caicos, and she hasn't stopped since. She's gone diving more than 250 times all over the world. "The underwater world is another realm," she explains. "Each dive is like going on a treasure hunt. There is an unexplainable anticipation of discovering something new with each dive, combined with incredible serenity and beauty." Claudia took a plunge of another kind about a decade ago. After 14 years as a bedside nurse and nurse practitioner in neurosurgery and trauma in Toronto hospitals, she noticed a CCO job description in 2008 that seemed like it was written for her. The Access to Care (ATC) program has long seen the value of embedding clinicians into Analytics and Informatics projects, and needed someone with a clinical background and experience in patient flow, surgical care and alternate level of care to take on the role as a clinical expert liaison on a small wait time information project. As much as she loved providing direct patient care, she decided she wanted to make the change. Now, as clinical group manager of the Surgery Information Program at CCO, Claudia leads a team of clinicians and business analysts. In collaboration with health system stakeholders, the team uses Wait Time Information System data to inform the Ministry of Health and Long-Term Care's strategies and decisions around patient access to surgical services and, more recently, primary care. The data supports resource management and capacity planning, ultimately leading to better healthcare for Ontarians. One element of her job that Claudia finds particularly rewarding is seeing how her work helps to improve access to better health services for thousands of people in the province. Claudia swings during a bungee jump. "The system is financially constrained, so we need to ensure that decision-makers have the right information at the right time to inform their choices about where to put every dollar in order to provide the best care," she explains. "That information is based on the data ATC collects and analyzes." Claudia's exploratory nature doesn't stop in the water. She has a passion for experiencing the world and different cultures. 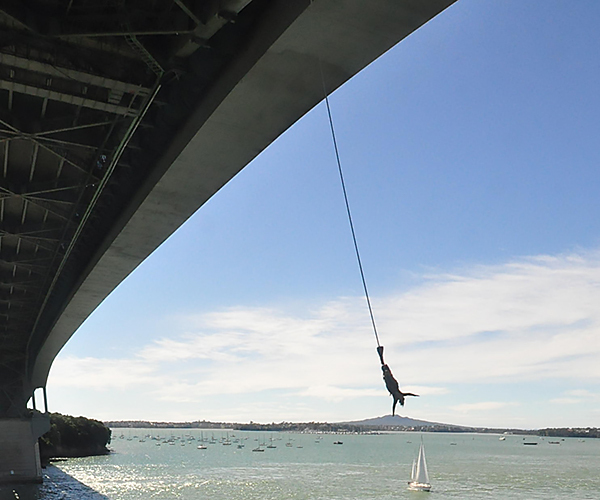 She's bungee jumped off the Auckland Bridge in New Zealand, trekked the lava fields in Hawaii, wandered through the historical marvels of Egypt, found tranquility in Indonesia and Tonga, and gone piranha fishing for dinner in the Amazon. 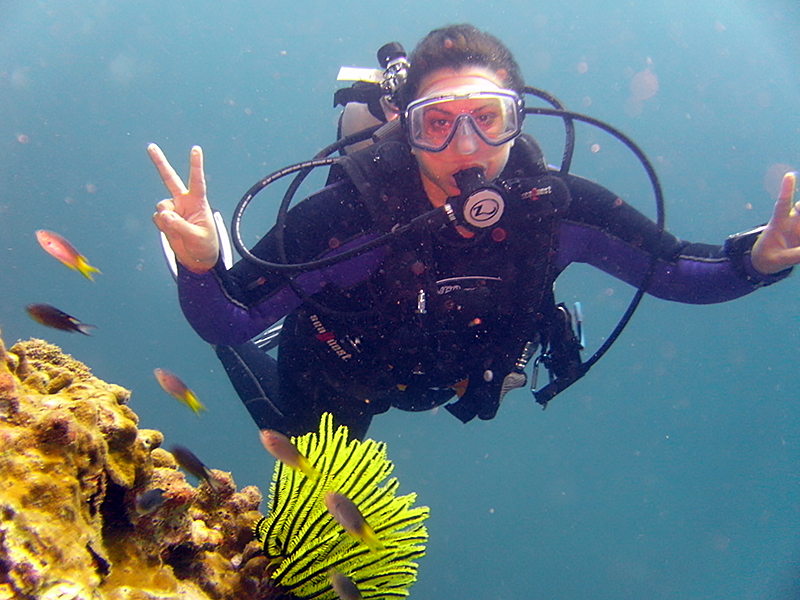 Claudia once paired her love of land and water on a scuba and safari trip. She drove over 6,000 kilometres through South Africa, Mozambique and Swaziland, then had an incredible tiger shark diving experience. While she says the depths of the ocean and the wonders of the world are fascinating, she finds the experiences gained at CCO very rewarding – none more so than mentoring staff. "It's one thing to achieve your own goals, but to watch someone else succeed because of the support you've provided to them is incredibly rewarding. I work with great people who make coming to work a pleasure and sometimes an adventure, and I'm always up for a good adventure!"